Update (7:13 pm, 4/1/2012) - We finally fixed all the inventories for this version of BM case for iPad 3. Now, fully support the Smart Cover function on the new iPad. (prior to today, this case was sold without this function at discounted price) ** During the transition, it is possible although not expected to have 1 or 2 old inventory mixed in the warehouse. Please contact us should you happen to receive one of them (Very very slight possibility). Made of highest quality Synthetic Leather - durability is guaranteed. It fits perfect for ipad3. The quality is good for $15 case. No complaint. This case has magnet to close the case, but it was not as fancy as some other case that has magnet to turn on/off the screen, but to be honest, I can always push home button using my finger and auto lock the screen after 1 minute. It's really not that big deal to me. ** Version 2 - Even better than ever before - Support Sleep Mode ** In the last a few days, we have received a few inputs from the end users. This helps us make the case even more user friendly than ever before. 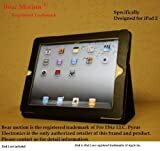 You will be receiving a case that is specifically designed for iPad 2 with details tailored to meet end users' every expectation. Now, we even made it to support Sleep Mode. It will put your iPad 2 to sleep when the cover is closed and it wakes it up when the cover is opened. (Sleep Mode needs to be turned on on your iPad 2). If you are not happy with the product by any means, although not expected, please email us back. we will make sure you are taken care of promptly and satisfactorily. -- This 100% Top Grain Leather Case is designed specifically for iPad2 - The Latest Generation of iPad tablet. If you search Top Grain Leather on Wikipedia, you will learn that Top Grain leather is considered as the second highest grade of leather, and is as strong and durable as full grain leather. It is split from the top layer of hide and sanded and refinished. This case is made of the High Quality Top Grain Leather. Why it is not made of full grain leather? Maybe you will ask. Full Grain Leather is very thick and heavy. it is not suitable for computer cases. Top Grain Leather has the durability that Full grain leather has to offer as well as the appropriate weight, thickness and texture a good iPad case should have. Bear Motion is registered trademark of Pro Ebiz LLC and is exclusively distributed by Pyrus Electronics. Bear Motion trademark is protected by US Trademark Law.